Then, to view the available categories and install all available tools, I selected option 2 from the main menu of katoolin and then pressed 0. Furthermore, I got an error in Software Updater - it didn't let me do anything. Ubuntu just hung up. I solved this problem by deleting kali linux repositories in katoolin and then in Software Updater. Does anyone know how to install Kali Linux tools in Ubuntu 16.04 in a proper way? Katoolin is a collection of scripts for automating the installation of Kali linux tools in different platforms other than Kali linux, and installing Kali linux tools with Katoolin in other OSs or Windows Subsystem for Linux is always less secure than installing the same tools in Kali Linux. Kali Linux is named after the Hindu goddess of destruction which should give the user some indication that even Kali Linux itself is risky and difficult to manage, especially for new users. Katoolin draws its tools from a variety of sources including apt and GitHub. Katoolin doesn't know anything about the platform that it is running on, so the safest way to use Katoolin is to install each tool the hard way one tool at a time, checking each time to see if that tool is included in the default Ubuntu repositories and if so installing it that way instead. When the installation is finished, the software sources that were added by Katoolin should be immediately disabled in order to prevent Katoolin from replacing packages that were installed from the default Ubuntu repositories with its own updated packages whenever Ubuntu software is updated. Press 0 to install all Kali linux tools. When you go to View Categories and then enter 0 for all, the installer will immediately return to where you were. Scroll up, and you'll see that a number of the packages can't be found. 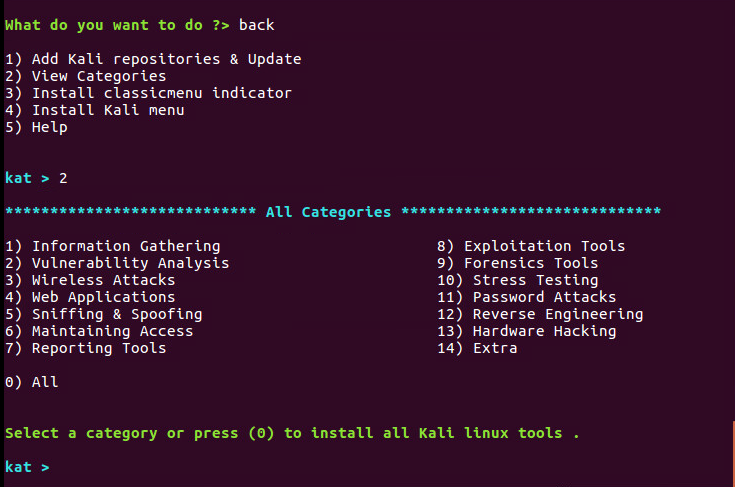 Those packages are no longer maintained or have been removed from the Kali repositories. Even with this issue, you'll still find a lot of the Kali software available for installation. So the best option is to install Kali linux tools in a series of distinct steps. Just like if you want to install Forensic tools on your system, then choose its option from the category and then type 0 to install all forensics tools. If this still doesn't work, then you have to install whatever forensic tools that can be installed one package at a time. This is why the Katoolin interface sometimes hangs when you try to install all of the Kali linux tools at once. Take the time of waiting for the server to respond to a request for a package that is not available and multiply it by how many unavailable Kali linux tools there are in the Katoolin repositories. If you wish to go back to the main menu, type gohome in your katoolin interface. Now select the option 3 or 4 to install either the classicmenu indicator or the Kali menu. Press the y key to continue and then press Enter to start its setup. Once you are done with installation of Kali tools using katoolin, you can quit by pressing the keyboard combination Ctrl+C and you will see the goodbye message. Credit for the above text block goes to Kashif at How To Install Kali Linux Tools On Ubuntu 16 And CentOS 7 with my additions italicized. After using katoolin and adding the repositories , its safe to run sudo apt-get update, but do not use apt-get upgrade if you do, your gnome and desktop will fail to start. 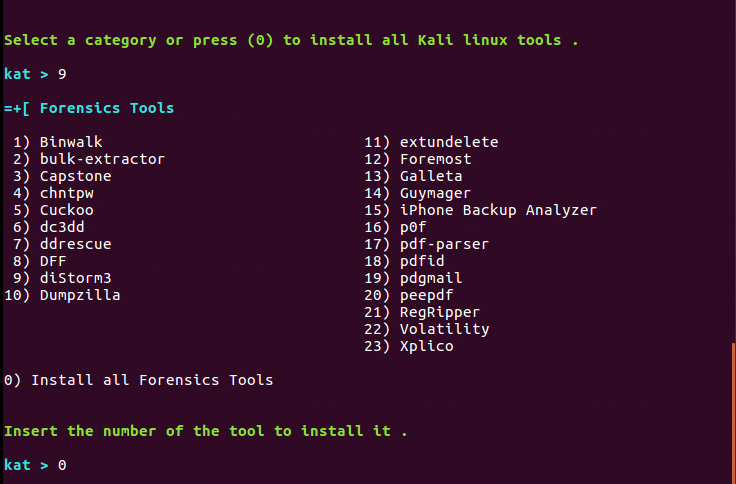 Install all the tools you want, after that do the cleaning by removing kali repos from your sources.list and apt-key. If any error occurs, it comes from the sources.list, meaning the package or tool is not designed/available for your Linux architecture or katoolin itself has to be updated, because repositories were changed by the owner. Keep in touch with katoolin developers. read more about aptitude: What is the difference between dpkg and aptitude/apt-get? 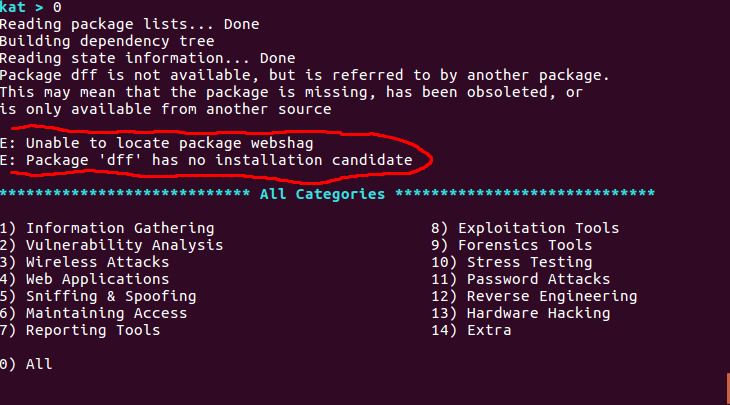 Read about the difference between unable to locate package & no candidates: What does Package <package> has no installation candidate mean? There is a step by step solution that avoids crashes here: Can I install Kali tools on Ubuntu? In Ubuntu 16: edit file /usr/bin/katoolin and remove all references for the both packages: dff and webshag and save file. Execute katoolin again - choose 1 and then 2 to update - after that type back and choose 2 and then type 0. After that I executed katoolin again - chose 1 and then 2 to update - after that type back and choose 2 and then 0 to begin installation. Edit the file /usr/bin/katoolin (eg use sudo -H gedit usr/bin/katoolin) and remove those two packages, just search for text dff and webshag. Remove those two from apt-get commands too. Not the answer you're looking for? Browse other questions tagged 16.04 kali katoolin or ask your own question. Trying to install Kali menu using katoolin but its showing you have unmet dependenies.How do I fix it? What is the difference between dpkg and aptitude/apt-get? What does “Package <package> has no installation candidate” mean? Can I install Kali tools on Ubuntu? How to install Kali Linux tools in Ubuntu 16.04 LTS? How to choose to install all apps at once in katoolin/Kali linux repositories interface? How to remove all Kali Linux tools? Is installing Kali Tools from Katoolin same as using Kali Linux itself?